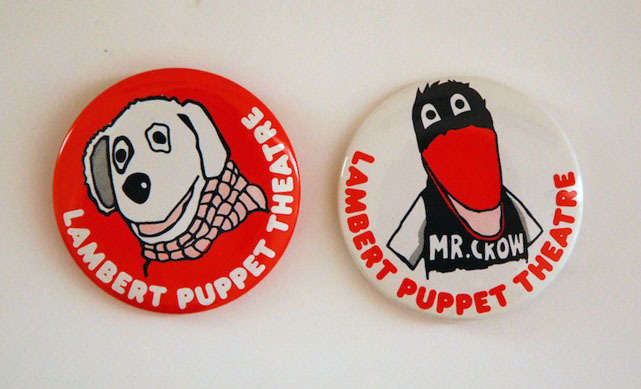 These two badges were produced by the Lambert Puppet Theatre, a much-loved local institution. Founded in 1972 by Eugene Lambert and his family, it was Ireland’s first purpose-built puppet theatre. The theatre also produced television programmes, including Wanderly Wagon and Bosco. Mr. Crow, depicted on one of the badges, was a character from Wanderly Wagon. The Irish Green Party was founded in 1981 as the Ecology Party, changing its name to the Green Party in 1987. 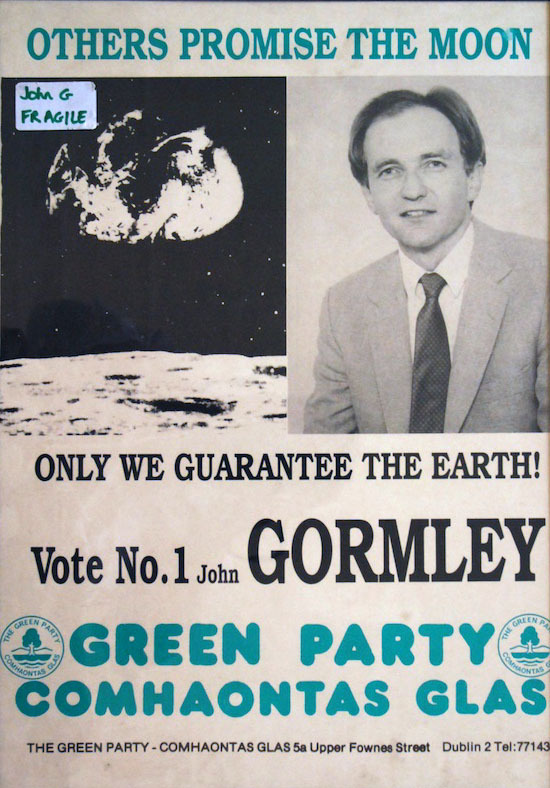 This poster is from the 1989 general election, the first time that the party used pictures of the candidates; they had been wary of the ‘cult of personality’ in politics. That’s why the picture of the earth is the same size as the picture of the candidate. The Greens did much better than anyone expected in the election, but no one in the party had much political acumen, so they only won one seat. John Gormley was eventually elected to Dublin City Council in 1991, served as Lord Mayor from 1994-95, and later led the party in a coalition with Fianna Fáil. 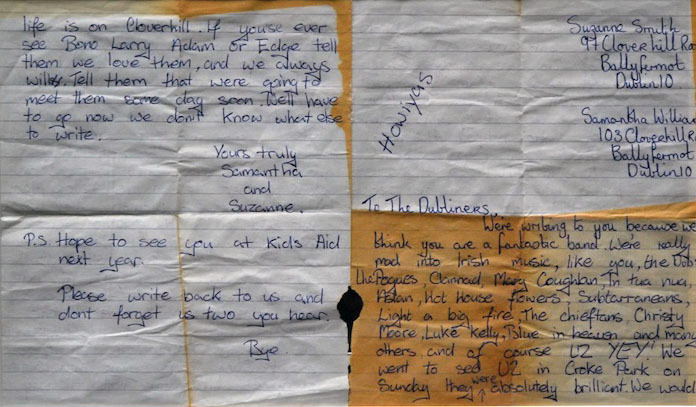 Two young fans of The Dubliners wrote this letter to the band in the 1980s – although they spend most of the letter telling the folk band how much they love U2. Despite tough times in the city, and especially in suburbs like Ballyfermot, these children evoke a colourful sense of community, fun and individualism. 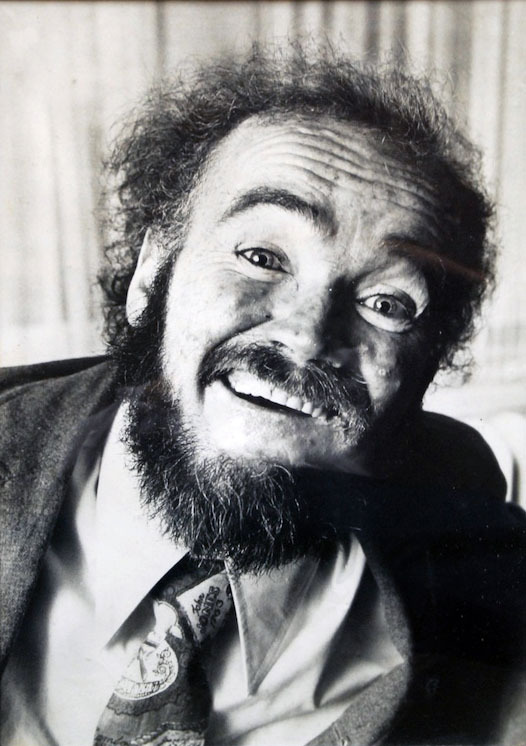 Brown is most famous for his autobiograpy My Left Foot – his left leg was the only limb over which he had complete control, so he taught himself to write and paint with his left foot. Noel Pearson’s 1989 film of the same name, directed by Jim Sheridan and starring Daniel Day Lewis as Brown, is one of the most celebrated Irish movies of the last 30 years. 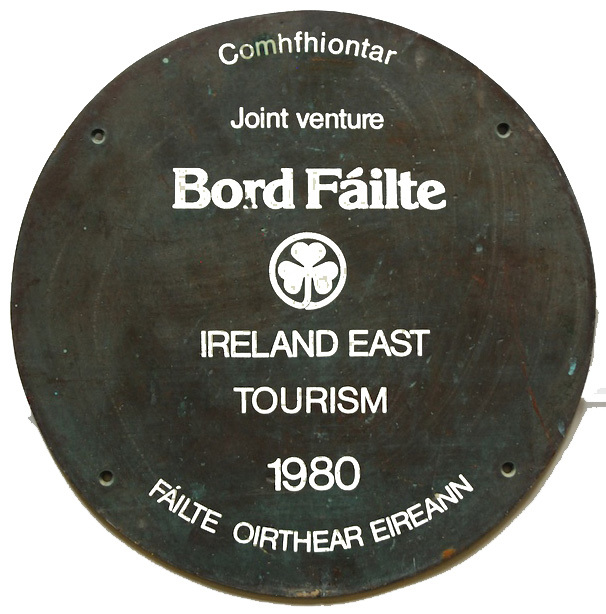 Bord Fáilte was Ireland’s tourism promotion organisation from 1955 until it was succeeded by Fáilte Ireland in 2003. In those days it put up signs at heritage sites, advertised Ireland abroad and produced events like the Rose of Tralee and the Dublin Theatre Festival. The Lord Mayor’s car registration is normally D-1, but was changed to D-1000 specially for the Millenium year. On the 16th of October, 1981, Ben Dunne Jnr. was kidnapped by the IRA on his way to open a new Dunnes Store in Portadown. Before his release on the 22nd of October, two of his abductors gave him some bullets and told him that they could easily have been used – one on him and the other on Fr. Dermot McCarthy. Fr. McCarthy had tried to secure Dunne’s release, making a plea on television and at one point meeting with Dunne’s kidnappers. McCarthy was nearly shot in crossfire. 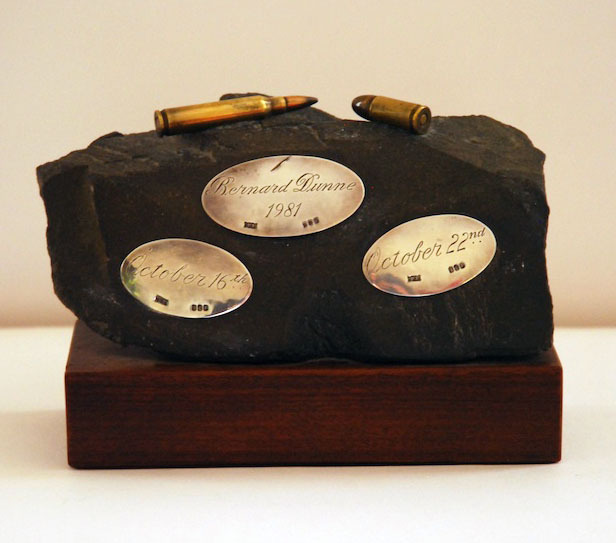 After his release, Ben Dunne mounted the bullets on a piece of stone from the cemetery in Armagh where he had been held captive. This bottle is an iconic souvenir of the millennium. 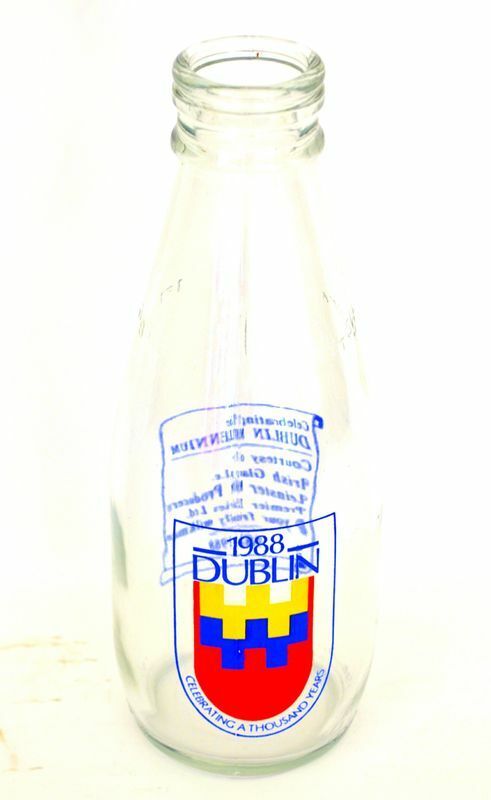 You’ll find one of these bottles in a Dubliner’s attic. Despite initial skepticism – the date chosen, 988 AD, was arbitrary – the millennium was eventually embraced by the people of Dublin. A showcase in London might do the trick. That’s where Stephenson came in – his Sense of Ireland Festival provided a platform for U2, the Virgin Prunes, Berlin, the Radiators from Space and Paul Cleary. Paul McGuinness persuaded Blackwell to bring the entire Island staff to the Acklam Hall, where U2 were playing as part of the festival. The band signed their first record deal a few days later. 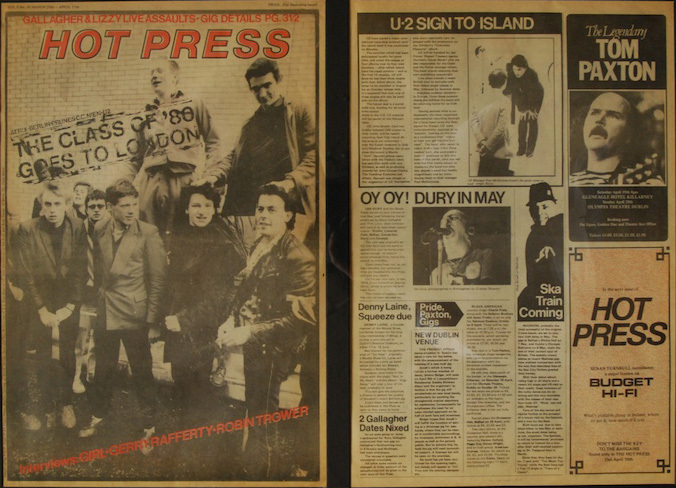 Hot Press is Ireland’s music magazine, founded in 1977 and edited to this day by Niall Stokes. The publication championed U2 and is still an important platform for emerging Irish music. 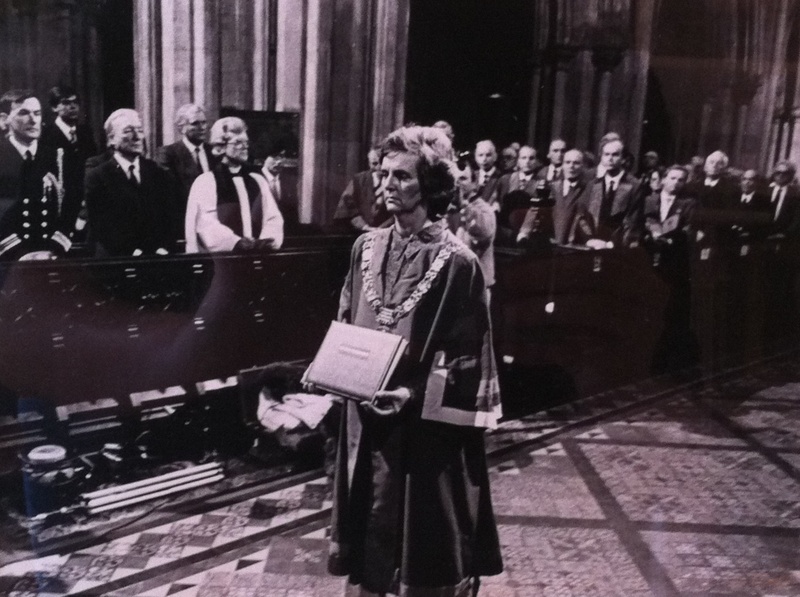 Carmencita Hederman, who was Lord Mayor in 1987, remembers: “When a Book of Condolences was opened in the Mansion House, we kept having to run back down to Eason’s to buy new books because so many people turned up. At a memorial service in Enniskillen, I presented the book on behalf of the people of Dublin.” This photograph was taken during that service – note the presence of one Charles J Haughey.